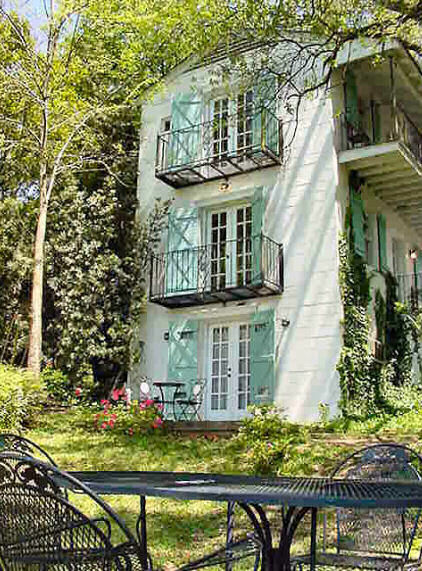 Local artist and historian, Irma Sompayrac-Willard, designed Andre's Riverview Guesthouse in the simple architecture of her ancestral home in a village in southwestern France. Built in the early 1950's, the Guesthouse is a three-story cottage on the east bank of Cane River. Andre's is located in the heart of Natchitoches "Historic District" directly across from the "riverfont stage" within easy walking distance of restaurants, shops, churches and parks. Our location makes it easy to enjoy all the downtown activities as well as a beautiful view of the river and frontstreet. With three separate, distinctive suites to offer, Andre's Riverview is a wonderful alternative to the typical Natchitoches Bed and Breakfast. For those seeking a little more privacy Andre's Riverview is ideal.